Alexander Milne Calder, the eldest of the family of Calder artists, gained fame for over 200 landmark sculptures he completed for Philadelphia’s City Hall including the massive sculpture of William Penn on top of the building. 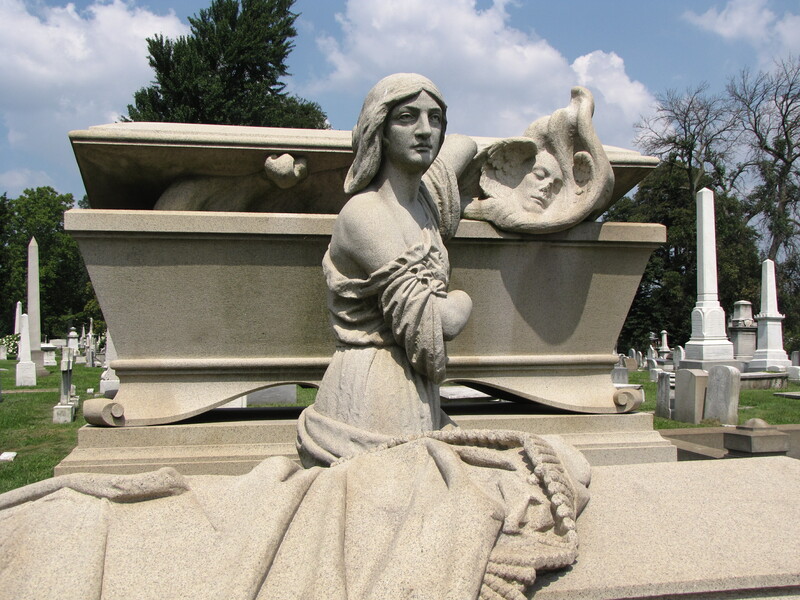 Calder, like many great artists, earned money from commissioned works including the William Warner Monument, a Victorian masterpiece of funerary art in the Laurel Hill Cemetery in Philadelphia. The female figure gazes into the distance, stoic and unemotional, as she lifts the lid of the coffin releasing billowing clouds that portray a visible face, presumably Warner’s. The visage swirls upward, with what appears to be faint wings amid the wisps, and is said to be of his soul being released from the grave to Heaven. 2 Responses to There goes his soul! Beautiful but a little on the freaky side. Of course, those Victorians were a little freaky about death and dying. Exquisite art. I’m amazed at the art you’ve found in your travels.